The legislative branch of the British government occupies what is officially called the New Palace of Westminster, situated on the original site of Edward the Confessor’s Palace of Westminster. The neo-Gothic building was begun in 1840 and the first Parliament was opened by Queen Victoria in 1852. Victoria Tower at the south end of the building is, at 336 ft., the tallest square tower in the world. Tucked into a niche along the west side of the building, is a statue of Richard I, Lionheart, striking a heroic pose. One of the world’s most famous landmarks, Big Ben is the clock tower of the Houses of Parliament. “Big Ben” was originally the nickname given to the 13 ton “Great Bell of Westminster,” but the term ultimately came to include the clock and St. Stephen’s Tower. The original specification for the clock (developed by Astronomer Royal, Professor George Biddell Airy) called for it to be accurate to within one second (the accuracy would be checked twice daily, comparing it’s time to the Royal Observatory’s standard). The clock making industry felt that this requirement would be impossible to achieve in a large, exposed, outdoor timepiece, but Big Ben has proven remarkably accurate, even during wartime. 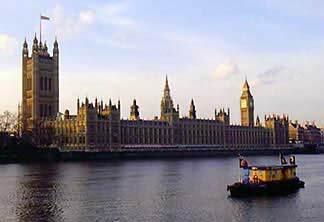 For example, during a WWII bombardment on 10 May 1941, the House of Commons was virtually destroyed, but Big Ben managed to lose only a half second of time through it all.